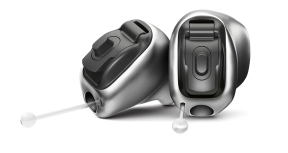 In March 2017 Phonak released their ultra discreet Virto B Titanium Invisible-In-Ear (IIC) hearing aid. It is Phonak’s smallest ever custom made hearing aid moulded to the exact shape of your ear canal. Medical grade titanium is known for its superior strength, light weight, and durability. Therefore by constructing the hearing aid from titanium, and using miniature components, Phonak have been able to make the Virto B Titanium 26% smaller than its previous model. 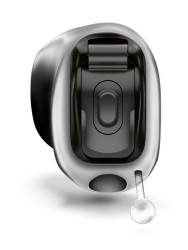 The Virto B Titanium is the latest member of Phonak’s Belong family of hearing aids. Therefore Virto B Titanium incorporates the highly successful AutoSense ™ Operating System, allowing the hearing aid to automatically adapt to changes in the environment without the need for any manual adjustment. This means you will always receive the optimum hearing clarity wherever you are. The Phonak Virto B Titanium also dust and moisture resistant to significantly improve durability.